Like a high-wire walker juggling nitroglycerin canisters in the middle of a howling windstorm, the TCX SP-Master Boots have balance. Eh, not the best intro sentence ever, but it will do. You get the point. With the SP-Master Boots riders get a pair of motorcycle footwear that hovers somewhere between the streamlined precision of sport and all-day, all-weather, all-miles comfort needed for touring. Dare we call them great for “Sport Touring?”. We dare. From the soft-touch microfiber upper to the added padding that has been incorporated to the front and rear for increased comfort, the SP-Master Boots scream to be worn, and worn for long periods of time. 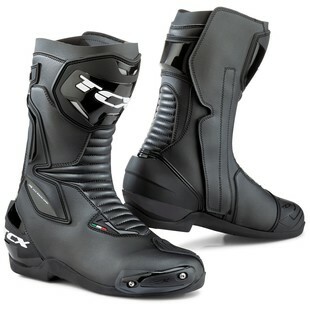 On the other side of the equation, however, they boast a PU ankle retention system, PU heel guards, and an ergonomic shin plate for the kind of protection one would expect on a go-fast sport boot. Additional features include interchangeable PU toe sliders, Air Tech breathable lining, and an upper gaiter that wraps around the calf for an exclusive fit. In the end, it all comes down to how well these boots walk the line between both worlds. It is hard to do, and in true TCX fashion, the SP-Masters have done it with aplomb.